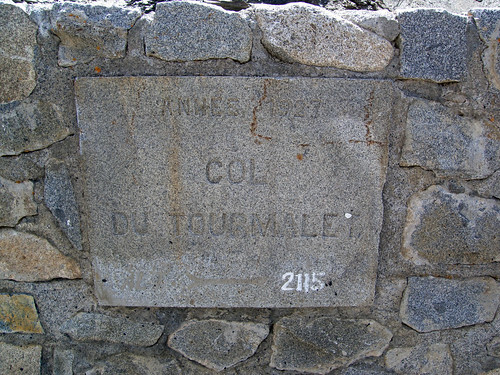 Col du Tourmalet is one of the most famous climbs in cycling and the highest cycling Col in the French Pyrénées. Today was just a dream day on the bike. It has appeared in the Tour de France more than any other climb – only being omitted a dozen or so times. 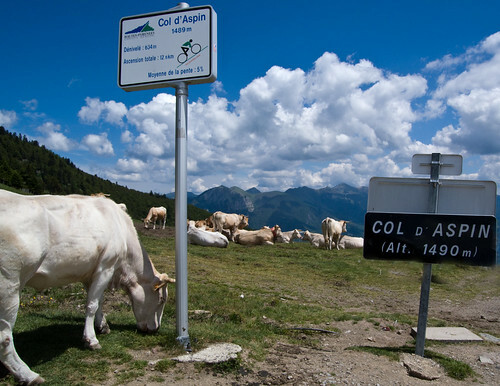 Stage 9 of the 2009 Tour de France will feature the east side after first climbing Col d’Aspin. 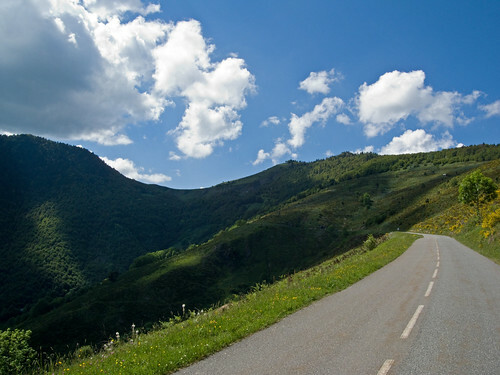 Starting from Campan, the first few kilometres are leisurely easy. But don’t be fooled, once you reach Gripp the fun starts: the last 12 kms average about 9% – this is a tough climb. 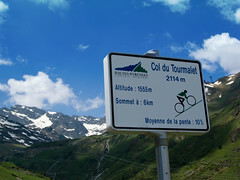 For details of the west side of Tourmalet from Luz Saint-Sauveur see here. The other side was still closed, so it meant no through traffic. The weather was perfect, and despite the steepness, I was in cycling nirvana. The ski station of La Mongie is about 4.5 kilometres from the top, and from here the rest of the ride hairpins up the ski slopes. The views are beyond spectacular (although I think the west side is even better). As I reached the top, I was searching desperately for the giant cycling statue. But apparently it wasn’t arriving until Saturday, as part of a big cycling day, it will be brought up and re-erected. I guess I’ll just have to come back. 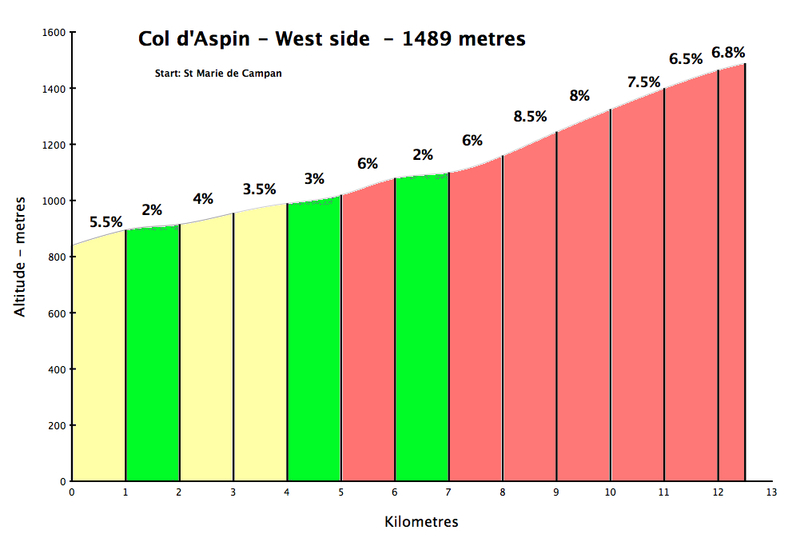 I descended back to Ste-Marie-de-Campan to climb the west side of Col d’Aspin. I was a little tired, but convinced myself to descend the other side so I could also climb the side that the Tour de France will follow. It was a great decision. Because while the west side of Aspin is pleasant – the views are generally behind (thus it’s a better descent). Whereas, the east side is a much more interesting (and challenging) climb. You can see the Col from the very bottom and the road winds up the side of a hill with fantastic views throughout. I took it slowly and just enjoyed the surroundings. A pretty huge, tiring day, but just an unbelievable ride. The less attractive side of Col du Tourmalet, but still terrific. And Col d'Aspin is just lovely without being spectacular. Much quieter in June or September than in summer. 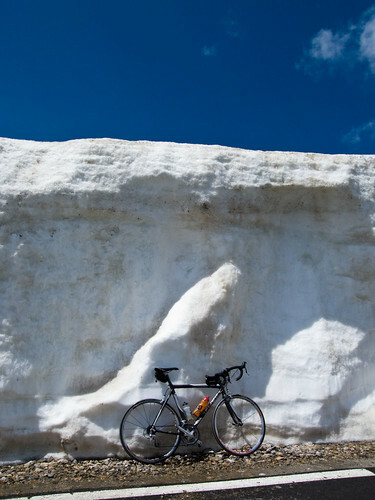 Wow what an amazing amount of snow on the col. 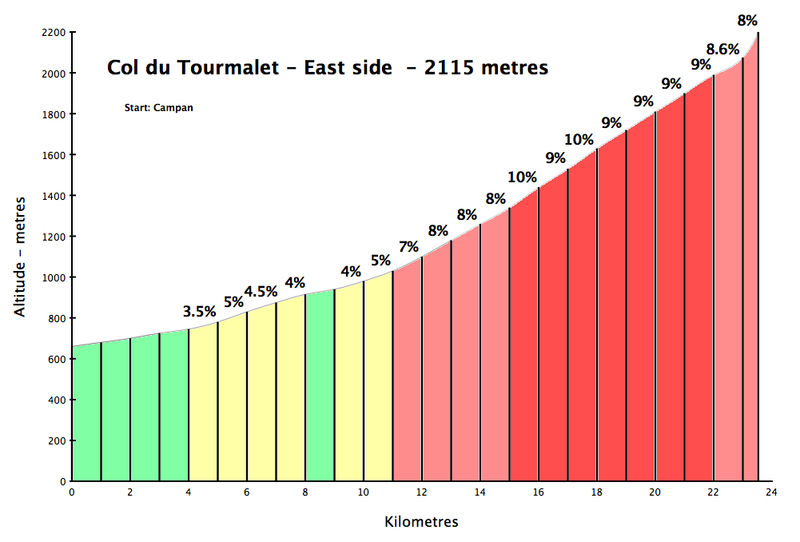 I wonder which side of the tourmalet is the hardest. I did it twice starting in Luz St. Sauveur and I suffered very hard both times. But they say the other side is even harder.. Awesome ride Will! It has my measly ride beat by a long shot: http://www.cyclemania.ca/road-biking/ottawa-cycling-champlain-lookout. As usual great story and excellent pics. The highest is the Port d’Envalira (2407 m) in Spain, e.g from Ax-les-Thermes to Andorra. BTW part of the Tour de France 2009, but in the other direction. 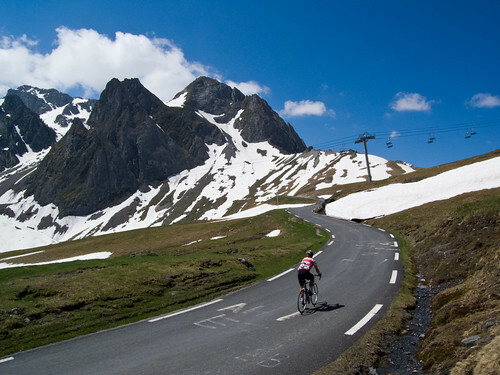 An alternative possibilty for your tour would be: Tourmalet (west.) 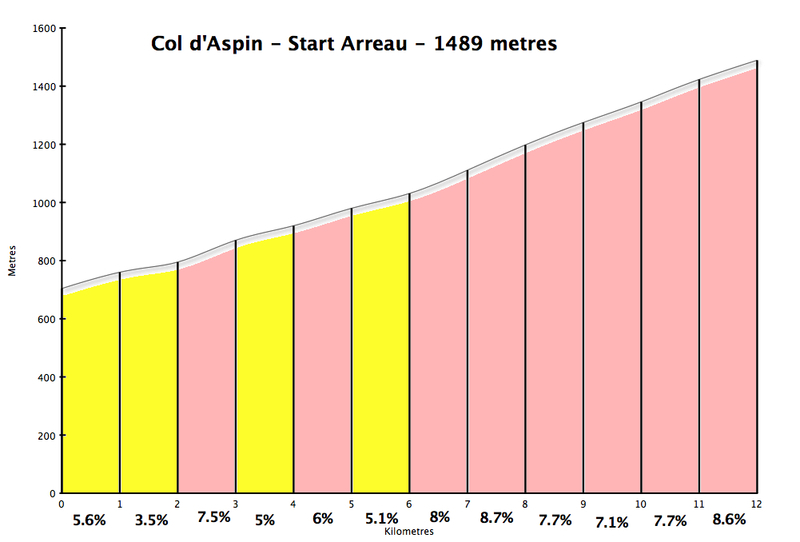 – Hourquette d”Ancizan – Aspin (east) – Tourmalet (east). Instead of the Col d’Aspin (west) you have to leave the street to the right in Payolle. Thanks for the info. So Tourmalet is highest in the French Pyrenees? It depends on the definition of a mountain pass (col)? Say: passage between 2 mountain peaks from one valley to an other one. 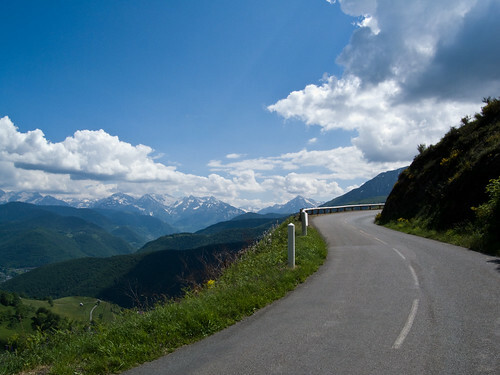 In this case the Tourmlet is a pass, I also think the highest in the French Pyrenees, at least under the paved ones. But Superbagnère is not a col in this sense (climbed also by myself). OK lower than the Tourmalet. For me it’s a mountain street to a ski resort. If you take e.g. the climbs to the lakes of Aumar (2190m) and Cap de Long (2160 m) one can also not speak of a col, but higher than the Tourmalet. I never climbed up there, I dream to do it, but not because of the altitude, but for the beauty of the countrysite. An other example: Col du Mont Sion,. just on the list on the right. For me it’s just the highest point on the route between Geneva and Annecy or so. Keep on with your great site, wish you a lot of pleasure on the way for your CHALLENGE.